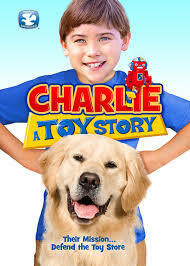 Get ready for a fun-filled adventure in this Dove “Family Approved” live-action feature as 10- year-old Caden and his best friend, Charlie, a golden retriever, set out to thwart the evil plans of the bumbling town bullies who are out to break into Caden’s Dad’s toy shop to steal his new one-of-a-kind toy invention. Filled with warmth and humor, this laugh-a-minute comedy will give you back your dreams and show you that anything is possible if you just believe in yourself! We watched Charlie: A Toy Story as part of our Family Fun Night. All three of our older children (7, 5, and 2) LOVED this movie! When I came downstairs the following morning, they were watching it again, and have watched it several more times since! It is wonderful for me when I find a movie that everyone agrees on! While the title is a bit mis-leading, as the story doesn’t really have anything to do with a dog, the movie is cute and a wonderful break from the more mainstream children’s movies. For me, the heart of the movie centered around the theme of belief in yourself. Throughout the film, children were reminded don’t stop believing in your dreams. Anything is possible if you believe in yourself. Both Caden and his father were able to demonstrate what a bit of belief in yourself can accomplish. As father and son worked to overcome obstacles and navigate difficult relationships, their belief in their dreams, abilities, and intrinsic self-worth proved to be exactly what was needed. I really enjoyed the movie and found myself rooting for the characters. Charlie: A Toy Story is a wonderful film for the whole family. Click HERE to purchase Charlie: A Toy Story for your family! One lucky Chasing Supermom reader will WIN this movie! Good luck! I tell them everyday that they can do anything they put their minds to, that Gpd has created them for great things. We let her know everyday that she can do anything that she puts her mind to! I encourage them and ask what they want to be. Encouragment, dreaming with them and a whole lot of love. I encourage hi to try new things and also to progress at the things that he currently loves, such as, drawing, singing, and playing with his train sets! I tell them everyday that they can do anything they want and that I will always be proud of them and support them no matter what. My daughter wants to be an artist and she is actually very good and has already sold some of her work. I encourage everyday to stick to it because I believe she has what it takes to make it! My nephew is 2yro and I make sure that when we have him that he is exposed to new and exciting things! by encouraging them to try new things and to never give up…. I try to encourage them when they say there is something they would like to do. He is only 3 and we give him lots of encouragment when he learns or accomplishes something new. I encourage them to explore new things and develop their talents. I tell them that they can do anything they put their mind to and NEVER to give up!! I encourage my daughter to be honest! I always tell them how proud I am of them for always trying as hard as they can.